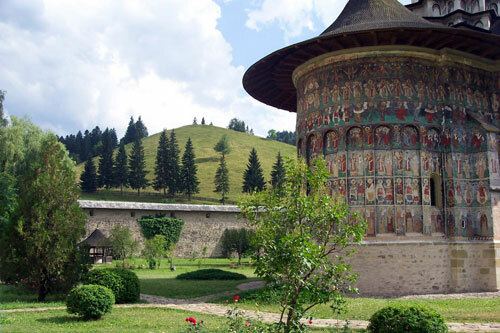 The first part of your journey leads up to the ‘Sweet Land if Bucovina’, with its world famous painted monasteries (UNESCO – World Heritage) and bucolic scenery. The second part tackles you to Transylvania with the Carpathian Mountains, known through Bram Stokers ‘Dracula’ and Patrick Fermors ‘Castles of Transylvania’ are unique with its combination of history, legends, scenery and wildlife. You walk in three mountains: Posavarul, Bucegi and Piatra Craiului. You will pass idyllic alms with shepherds huts scattered around, walk through mountain villages, still unspoiled, and enjoy splendid mountain views. Drop off at Bucharest airport after the tour on Day 9 included. Overnight in a hotel in Bucharest. Train journey to Suceava (5 ½ h) and transfer to Putna Monastery. Visit Putna Monastery, the spiritual center of Romania. You may have a short round walk (1 h) to “Chilia lui Daniil Sihastrul”, a small hermitage dug in a rock. In the 15th Century it was inhabited by the hermit Daniil who supposedly predicted to Stephen the Great that he will become ruler of Moldavia. After becoming ruler, Stephen the Great was advised by Daniil to build the Putna Monastery. Accommodation in a guesthouse in the village, close to the monastery. From Putna you take the old monastery path to Sucevita Monastery. In summer, the forest is full of berries and wild mushrooms. The undercoat of emerald green on which the superb frescoes are painted (1596) gave the monastery the name ‘a Poem in Green and Light’. The iconostasis is supposed to be the most beautiful one in the country. Sacherverell Sitwell wrote in 1938: “The first view of the painted church of Sucevita is among the most impressive revelations of the Byzantine world”. The little museum houses the most precious collection of medieval art in Moldovia, including medieval embroidered portraits and an epitaph with 1000 pearls. The 2 following nights are spent in Sucevita, in a welcoming guesthouse with excellent food. A car takes you over the Ciumarna pass with astounding panoramic mountain views. Visit Moldovita Monastery, famous for its warmth and brilliance of its frescoes. The blue undercoat for its tree of Jesse gave the monastery the name ‘a parchment dipped in blue color’. Very beautiful is the Ladder of Paradise, which has the ascetical mystic of John Klimakos as a theme and the depiction of the ancient philosophers. Maybe you meet Sister Tatiana (she speaks some English) who will show you around. The little museum contains, besides a priceless silver-cased Evangelistary presented by Catherine the Great of Russia, valuable icons and miniatures. Back in Sucevita you may have a round walk and enjoy the bird’s eye view upon the impressive, fortified monastery. Transfer to Voronet Monastery. “Voronet-Blue” is the key word. Its superb frescoes gave it the name ‘the Sistine Chapel of the East’. Architecturally it combines Gothic and Byzantine features. Petru Comanescu still holds its truth: ”…here in the clear mellow light of those parts of the walls of the church seem to have stolen the sparking blue of the sky, the green of the trees and the pastures, the gold of the sun and the red of the flowers growing in the peasants gardens”. Walk up to the Objina with good views over a valley and villages scattered around till you reach Humor. Humor monastery, which exudes friendliness and tranquil charm, is painted in warm blues, greens and reddish browns (from oriental madder pigment). Accommodation in a guesthouse in Humor. Visit the Dracula castle. It served as backstage for Roman Polanskis film ‘Dance of the Vampires’ and in former years the Romanian Queen Mary of Hohenzollern, the Granddaughter of Queen Victoria, as refuge and Salon. Short transfer to the Kalibash village of Magura, situated 1000 m up in the mountains. Round walk to Pestera. On your way you may see orchids, gentians, campanulas and endemic flowers like the ‘Carpathian Iris. Little farms are scattered around over beautiful alpine pastures and meadows covered with wildflowers. Overnight in this most beautiful surroundings in a guesthouse with beautiful views over the mountains. Walk through the spectacular Prapastiile Zarnestilor (Zarnesti Canyon) to the rustic Curmatura mountain hut (1470 m) where you may have a drink or a meal, then walk to Zarnesti. You may see wall creeper, alpine swift and with some luck the tricky three toed woodpecker. Zarnesti once was made famous through a ‘Large Carnivore Project’. Overnight in a welcoming guesthouse in Zarnesti.